Save 20% on AgriDry’s Best Products! If you have ever had grain quality issues in your storage bins, then we at FS Construction Services have a great deal on the perfect solution for you! FS Construction Services knows that our customers demand and deserve the highest quality products. This includes products for the drying and storing of grain. That’s why FS Construction Services partners with AgriDry, a premier provider of grain drying monitoring solutions. Together with AgriDry, FS Construction Services is proud to announce an excellent promotional opportunity that is available for a short time only! Available only until November 30, AgriDry is offering a significant 20% discount on all product purchases of $1,000 minimum or more. Continuing into December and available until the end of the year, is a 17% discount on AgriDry products of $1,000 or more. If you are tired of panicking over your grain bins, AgriDry has the solutions for your problems. AgriDry products, including some of the best in agricultural business, include the Gravity Grain Spreader, Bullseye Bin Controller and All Temp View. The AgriDry Grain Spreader is the only spreader that spreads the fines of the grain uniformly, without conceding quality. And AgriDry’s spreader is strong – strong enough to handle 40,000 bushels per hour fill rates, yet gentle on the grain – preserving the maximum amount so you can store and sell the largest quantity of grain possible. 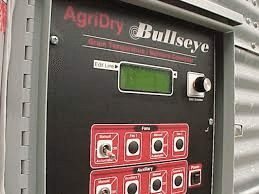 With the fastest ROI in the industry, the AgriDry Bullseye Controller automates bin fans so the right air is pushed through the grain to maintain market moisture. It optimizes your fan run time and eliminates grain shrink. Another great product, AgriDry’s All Temp View, monitors hotspots and temperature changes by giving you the unique ability to view all temperature sensors in your grain bin. You can depend on Gateway FS Construction Services to provide you the very best in grain drying, monitoring and storage systems. To take advantage of this fantastic AgriDry offer, give us a call at 866-551-3454 and let our specialists help you choose the best grain systems to meet your specific needs. We look forward to providing you the best customer service experience. Do you need new portable grain storage and handling equipment but are not sure if you can afford it? If so, the United States Department of Agriculture (USDA) has a deal that you may want to consider! Available through the Farm Storage Facility Loan program, the USDA recently announced a new financing option for producers that are interested in purchasing portable storage and handling equipment. This new loan program’s main goal is to assist farmers, particularly new or small to mid-sized farmers, grow their respective businesses. The heart of this new financing program is being termed a “microloan” option. Mainly for producers seeking a smaller loan and needing a smaller down payment, a microloan allows applicants to apply for a loan of less than $50,000 and pay a reduced down payment of 5 percent. In addition, there is no obligation to provide three years of farm production history or inability to secure commercial credit in order to apply. Larger farming operations that may not be eligible to participate in the microloan program still have the traditional loan option available to them. Participants of the traditional loan program must pay a down payment of 15 percent but are able to request loans of up to $500,000. Loan terms vary, depending on the amount of the loan, as do interest rates. If you are interested in more information on either the microloan or traditional loan, please visit the USDA website or your local Farm Service Agency office. Whether you opt for the microloan or traditional loan, as soon as your loan is secured, come visit the professional team at FS Construction Services. We at FS Construction Services are proud to provide our customers the very best in both permanent and portable grain handling and storage systems. Whether you need bin wells, conveyors or augers, we will work with you to be sure you have the proper tools you need to most efficiently handle and transfer your crop. You can depend on Gateway FS Construction Services to provide you the grain storage and handling systems that you need most, when you need it. Give us a call at 866-551-3454 and let our specialists help you choose a portable grain handling or storage system to meet your specific needs. We look forward to providing you the best customer service experience. 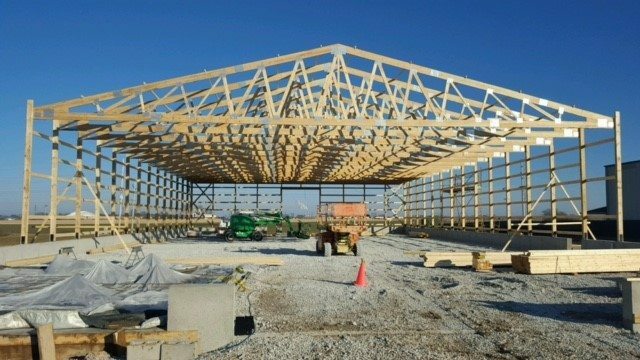 Considering A New Wood or Steel Building? Consider FS! Recently constructed by FS Construction Services, this versatile wood building is built on a four-foot foundation wall. With a two-story office area, this structure has enough space to fit an airplane! Completely with a 20’ x 16’ steel-backed and insulated door on one end and a 14’ x 16’ steel-backed and insulated door on the other, this building allows for oversized loads to be easily brought in and exit the facility. The exact specifications for this building were: 80’x152’x18’ total building and, a 24’x27’ office space. This unique structure was custom designed and built to our clients demanding needs and the highest possible quality standards. Basically, it delivered exactly what the client needed. 1. Flexibility – Wood or Steel. We’ll help identify the right solution for you. 2. Custom Design – Our experts can help design a solution to fit your exact needs. 3. Construction Experts – Let the FS Construction team put our experience to work for you. If a new building is in your future, call FS Construction Services, and you will receive these ultimate benefits with absolutely no red tape. When working with us, you have the freedom to design and layout your building to your liking including our vast roofing and siding material and color options. At FS Construction Services, it is our priority to provide you with the best building construction, no questions asked. This is just one of a variety of buildings we can deliver for you. At Gateway FS Construction Services, we are here to build you what you want, when you want it, all while keeping as much money as possible in your pocket and guaranteeing you the latest construction technology. For more information regarding wood building construction, please do not hesitate to contact us at 866-551-3454. We look forward to providing you with the best customer service experience.